The squadron was established as part of a reorganization intended to increase the combat readiness of the Naval Air Reserve Force. It was to provide tanking, pathfinding and COD service to the Atlantic and Pacific Fleets and other units around the world. The squadron’s first operational mission was conducted when it provided tanker support for CVWR-20 aircraft embarked in Independence (CVA 62) for a training exercise. The squadron conducted its two weeks of active duty training embarked in John F. Kennedy (CVA 67) as part of CVWR-20. This was the first complete Reserve Carrier Air Wing deployment aboard a carrier. The squadron conducted its first overseas operational assignment by providing tanker service across the Atlantic for RA-5C Vigilantes returning from a Mediterranean cruise. Squadron aircraft provided COD services for Constellation (CVA 64) on Yankee Station and Enterprise (CVAN 65) in the Indian Ocean. Squadron aircaft provided COD services for Kennedy while she was operating in the North Sea. The squadron aircraft operated out of NAF Mildenhall, England, during this evolution. Squadron aircraft provided support for Yellow Aspirin, a CNO mission to Kuwait to review the defense capabilities of that country. Squadron aircraft provide COD and refueling support during NATO Operation Swift Move for the air wing embarked in Kennedy, operating in the North Atlantic. During the Yon Kippur War in the Middle East, squadron aircraft provided support for Operation Nickle Grass, the transatlantic flight of A-4 Skyhawks to Israel. During civil unrest and the Turkish invasion of Cyprus, squadron aircraft provided tanker and logistic support for Forrestal (CVA 59) and Independence (CV 62) operating in the area of Cyprus during the crisis. Squadron aircraft provided support for the NATO Exercise Teamwork conducted in the North Atlantic. Squadron aircraft provided support for the NATO Exercise Northern Wedding conducted in the North Atlantic. 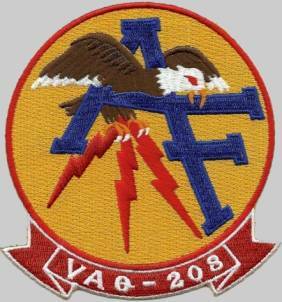 Squadron aircraft operated out of NAF Mildenhall during this exercise. 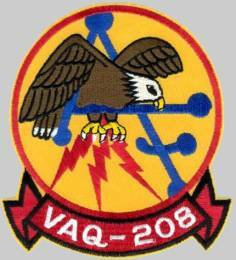 The squadron was redesignated Aerial Refueling Squadron 208 (VAK-208) and the mission of the squadron changed to primarily tanker service. The electronic warfare capability was removed from its mission.